German offshore wind developments in the North and Baltic Seas are further from shore and in deeper water than most European projects to date. Eize de Vries investigates the associated technological, manufacturing and logistical problems that foundation designers must address. Many future German offshore wind projects are planned far from shore in water depths of at least 40 metres. In the physical marine conditions encountered in such waters, dedicated state-of-the-art 5-6MW turbines (and larger ones in development) already offer substantial cost of energy benefits, with the potential for even more. Choice of foundation is closely linked to turbine size and location, while the capability and availability of foundation installation vessels is also a factor. Until recently, the wind industry had agreed that monopile foundations would reach their limit at depths beyond 20 metres and power ratings beyond 5MW. This is clearly reflected in the foundation choice of the world's first dedicated offshore 5MW turbines - the Repower (now Senvion) 5M and the Multibrid (now Areva) M5000. Both installed prototypes in 2004 and chose company-specific foundation designs - the Senvion 5M is on a four-legged steel jacket and the Areva M5000 is on a steel tripod. Both foundations have their origins in the oil and gas industry, but were adapted and optimised to meet specific offshore wind requirements. In the oil and gas industry, support structures are often dedicated single-piece or limited series products, with manufacturing costs of minor importance. By contrast, for wind there are always huge cost pressures and a requirement for repetition of largely similar products at project level at least. The wind industry is working hard to develop standardised foundations suited to a variety of water depths, seabed conditions and turbine sizes. By the end of 2014 Areva will have installed 126 M5000 offshore turbines, all on tripods. Tripods are in essence a spaceframe consisting of a central pile, three coning side members and a bottom section together creating a strong and stiff triangle-based structure. Drawbacks include a need for custom-made tubular steel components, precision cutting and welding preparation. The complex and time-consuming welding makes production automation difficult and increases manufacturing costs. For joining eclipse-type and other difficult shapes, German specialist Weserwind invests heavily in automation and in preselecting components with so-called "best-fit" methodology, for which it uses advanced algorithms. Areva has been looking into the joint development of an optimised jacket foundation with STX France. Jackets are also being considered for Areva's future 8MW turbine, with a target of cutting cost of energy by up to 40%. It remains to be seen how the recent Areva-Gamesa offshore joint-venture announcement will affect their 7-8MW turbine developments - and foundation preferences. 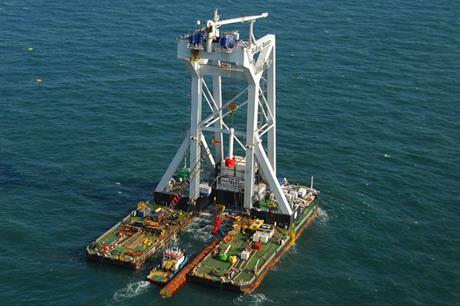 Most offshore projects with Senvion 5MW and 6.15MW turbines are mounted on jacket foundations, with only one six-turbine 30MW project in Belgium using gravity-based foundations instead. According to Senvion foundation specialist Marc Seidel, the main challenges for gravity-based structures are logistical rather than technical. That other players in the top segment, Alstom (6MW) and Vestas (8MW), also seem to prefer jacket foundations reinforces the structure's position as the leader for deep-water, large-turbine projects. A jacket is a spaceframe structure, comprising three or four semi-vertical main members with a wide base and multiple horizontal and cross members to create stiff triangles. This open structure contributes to favourable mass properties but manufacture is labour-intensive and involves careful preparation of the many welding joints, especially in areas where multiple pipes meet. Avoiding excessive heat build-up in this pipe-welding is crucial to prevent component and structure distortions and maintain the original steel's integrity. To overcome these issues and promote production automation, Weserwind and Senvion pioneered a four-legged design based on cast-steel nodes, called Variobase Jacket. This industrial manufacturing method is now being adapted by other companies. One of the latest jacket developments using this technology is by German company ThyssenKrupp Mannex. Called Hexabase, it is designed to avoid expensive custom-rolled offshore pipes and uses standardised cast-steel interconnecting joints of nodes in combination with straight-cut pipes, enabling simplified manufacture with a high degree of automation. Siemens is promoting a four-legged jacket design where bolted joints replace welding, aiming to reduce manufacturing time and produce a modular design that will enable industrial production on a large scale. Another novel jacket development is the use of suction buckets to fix the structure to the seabed. Danish utility Dong Energy and Dutch company SPT Offshore are among those promoting such foundations, with a view to faster, less weather-dependent and therefore more cost-effective installation. Both have chosen a three-legged structure, with SPT claiming its solution is suitable for depths up to 60 metres and allows installation of the turbine, tower and foundation as a single unit. Developer manufacturer Bard Offshore used in-house-developed tri-pile foundations, comprising three monopiles and a central transition piece, for its 400MW German 80-turbine North Sea deep-water project completed in 2013. Despite efforts to optimise manufacture and a built-in standardisation feature for various soil conditions and water depths, tri-pile foundations are not considered price competitive, especially set against steel jackets. The popular view that the combination of bigger turbines and deeper water would see jackets used at the expense of tripods, with monopiles gradually phased out, has been revised. High jacket manufacturing costs have instead driven the development of supersized monopiles for 6MW class turbines in up to 40-metre depths. Their staggering dimensions include outer pile diameters up to 10 metres and combined masses of pile plus transition piece of between 1,500 and 1,800 tonnes. "Monopiles have completed a large part of their learning curve, resolving serious past issues with failing grout joints between the pile and transition piece," says Edwin van de Brug, commercial manager of Dutch contractor Ballast Nedam Offshore. The company operates the HLV Svanen, a huge floating installation vessel with a maximum hoisting capacity of 8,700 tonnes, and the company is one of Europe's market leaders for installing monopile foundations. "The structures are straightforward from an engineering point of view, and a lot of experience has been gained installing them in a wide range of sizes suiting different power ratings and water depths, says van de Brug. "The new XL and even bigger XXL monopiles continue to offer huge potential, both for new-generation 6MW turbines with 150-metre+ rotors and future 8MW sizes and perhaps even bigger." Van de Brug does point out that of the 56 installation vessels currently available to the offshore market at acceptable day rates, only three are capable of hoisting 1,500-tonne loads. He believes that the paucity of such heavy lift vessels could have a substantial impact on developers' choice of foundations, with weight affecting foundation design choice. The number of operating floating turbine projects worldwide is still limited. However, a substantial number of such projects are at various stages of development and the technology appears to be progressing at a faster pace than was anticipated just a few years ago. An unusual tension-leg-platform (TLP) solution that has gained much wind industry attention is being developed by German engineering consultancy Gicon. The solution incorporates vertical and diagonal cable bracings between the (semi) submerged platform and the seabed. The consultancy claims that the Gicon-SOF has better operating stability characteristics than monopiles. It says that the design allows deployment in water depths of up to 700 metres. Gicon plans to install a 2-3MW Baltic Sea floating turbine pilot this year, and a 5-6MW North Sea pilot in 2015.